The cure for all that ails you. Update 5/24/16: looks like Mike’s is closed? There’s a fence erected all around the restaurant. I work in one of the least picturesque areas of Los Angeles, near Vernon. This is an overwhelmingly industrial area, and as I skate to work, I choke down lungfuls of toxic semi-truck exhaust every morning. The sun seems to be consumed by a dense, grey fog. The traffic is barely moving. I’m struggling to avoid potholes beneath my skateboard, and the anger from the passing motorists is palpable, intensifying an already apocalyptic atmosphere. But every once in a while I see a funny bumper sticker. When lunchtime rolls around, sometimes I feel the need to cheer myself up with a little self-destructive treat just to remind myself that I’m alive. 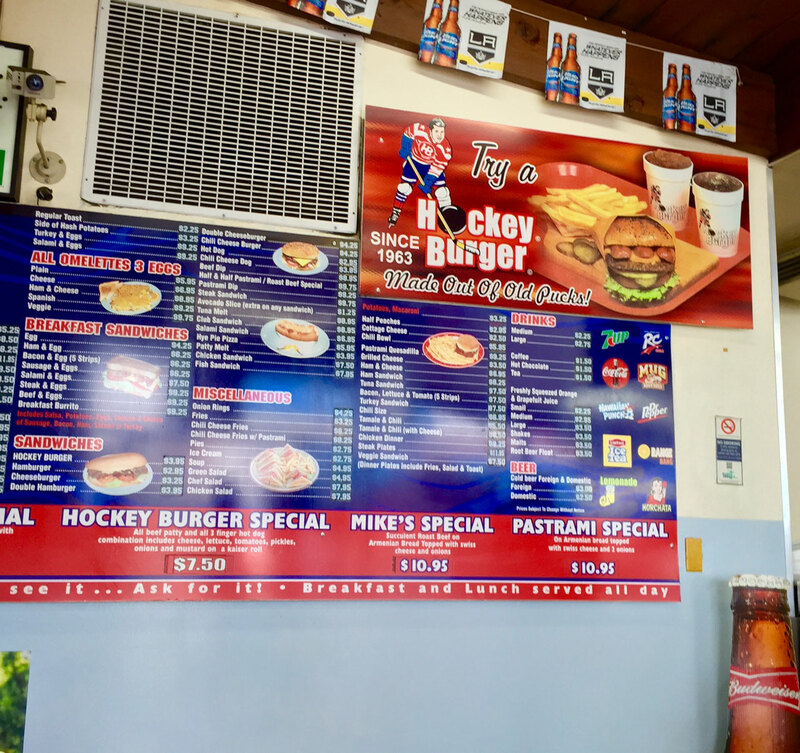 So I head to Mike’s Sandwich Shop for the intriguingly named “Mike’s Hockey Burger” – the greasy antidote to blue collar ennui. 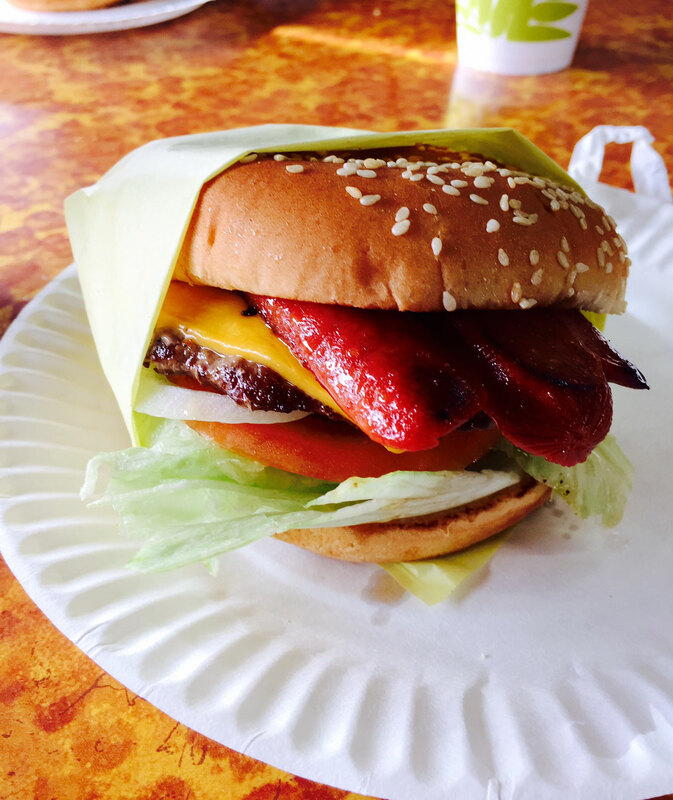 The Hockey Burger’s main ingredients are ground beef, polish sausage, and cheese (you can request one without cheese as a healthier alternative). These three ingredients (a “hat trick”, if you will) are the perfect lubricant for those difficult feelings; Why wallow in sorrow when you can swallow instead? Imagine each tricky emotion completely covered in grease, sliding its way down the old gullet (throw in a few fries for good measure). The nutritional value of a Mike’s Hockey Burger may be negligible, but the therapeutic worth just can’t be measured. This item is named after Mike Chitjian, who played professional hockey in Chicago, and the tagline for the burger is “Made out of old pucks!”, practically taunting you to try it, lest you be a sissy. As you look around the dining room, you see a collection of used paper plates on each table, nearly transparent from grease – you’re immediately conditioned to not expect much from your lunch. The customers? Quiet, relaxed, burly workingmen who are evaluating me just as I am evaluating them. They seem like they could crush me. They’re probably nice guys, but I seem positively dainty and petite compared to them. Maybe a steady diet of hockey burgers will cure that. The lady at the counter takes my order, and asks with a frown, “any substitutions?” I can tell from her body language that my answer should be “no” (or “no, ma’am”). I considered asking for a knife and fork, just for a laugh, but I wasn’t sure how that would fly. 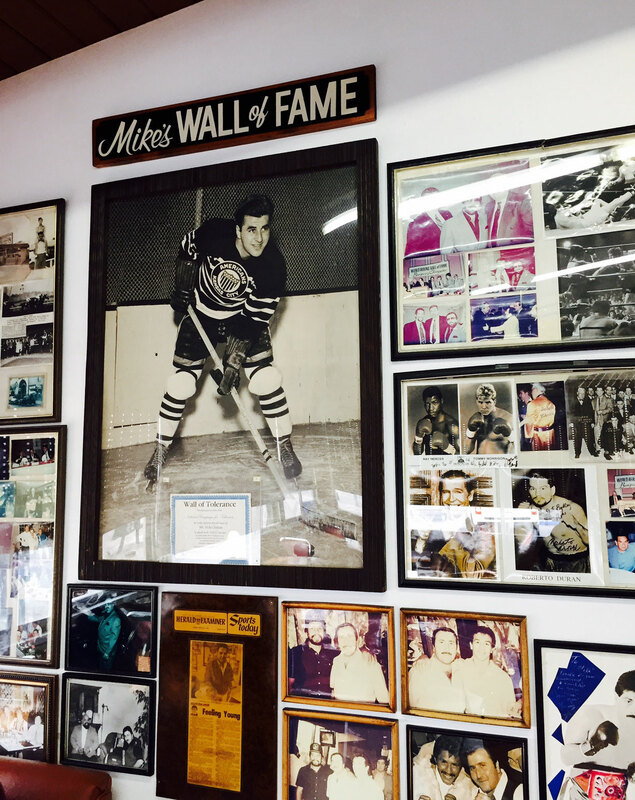 Mike’s seems like a place where everybody could eventually “know your name” – if you made it a habit to self-medicate with hockey burgers. When that greasy bundle of joy arrives at my booth, I’m devouring that sucker. A soothing wave of oily goodness coats my insides, then I glance at the “Wall of Fame” in front of me. A sobering sign is attached to the lower edge of an extra-large framed photo of Mike, a certificate awarded to him entitled “The Wall of Tolerance”. This April marks the 100-year anniversary of the horrific Armenian Genocide; one of the darkest periods in history, when millions of Armenians were systematically massacred and brutally abused. As I guiltily chew my indulgent lunch, I resolve to be a better person, and not to focus so much on the misery of my commute. It could be worse. Let’s all be good to each other, and bad to ourselves. Here’s my pro-tip: remove the lettuce.